SECOND QUARTER: Holy Redeemer took control of the game adding two hoops to the score and outpacing St. Clare 8-4. St. Clare added three buckets in the second quarter but were in the red at the half time buzzer as Holy Redeemer put 13 points on the board. Final second quarter: 17 – 10 Holy Redeemer. THIRD QUARTER: St. Clare missed to early free throws but came back with a two pointer in the first minute of play to reduce the deficit to 5. With 5:25 to go, St. Clare had held Holy Redeemer scoreless, going ahead by a point 18-17. The crowd roared! Not a team to cower, Holy Redeemer sunk a 3 pointer to go ahead by 2. FOURTH QUARTER: St. Clare quickly answered with their own two points to tie it up and we were in the midst of a barnburner for sure! St. Clare added another two with 2:20 in the game to go ahead by 2-22-20! With 1:11 in the game, Holy Redeemer drew a foul but could not convert. Last minute helter skelter and long passes contributed to turnovers by both teams. St. Clare went to the line to shoot 1 and 1 but could not convert. Holy Redeemer dribbled the floor twice looking for a go ahead score, successful on the second attempt leaving 22.2 on the clock and two points ahead 24 – 22. St. Clare strategized for the last several seconds of the game for the final basket to tie. Lauren drew a foul for St. Clare and sunk the first shot. She missed the second basket and that was all she wrote. FINAL 24 – 23 Holy Redeemer. CYO 3 Girls City Double Overtime! St. Pius X scored the first basket in the first minute of the game. St. Clare added a point off a free throw with two minutes left in the first quarter. Score at the end of the first quarter was 2 – 1 St. Pius X. Barnburner in the making. St. Pius X added another 2 points at the opening of the second quarter as both teams appeared warmed up and over the jitters. Another two points for St. Pius X made it a 6-1 game. With 37 seconds left in the first half, St. Clare scored a basket and controlled the ball until the buzzer ending with a score of 6-3 St. Pius X. Second half action saw St. Clare score quickly adding two points to their deficit. A foul with 1:12 in the quarter added one point to St. Clare, evening the score at 6-6. St. Pius X started out the fourth quarter with a basket advancing 8-6 with St. Clare attempting a 1 and 1 and unable to convert. The game was getting very exciting and the crowd was roaring after every shot. With one minute to go, St. Clare tied the game at 8-8. With 23 seconds left and a tied game, St. Pius X had a chance to score on a free throw but could not convert. St. Clare had the same opportunity with 6 seconds left and missed, throwing the game into overtime tied 8-8. Overtime 1: (2 minutes) With 42 seconds left in the first quarter, St. Clare scored one point on a one and one, leaving St. Pius X 35 seconds to battle back. Pius was fouled with 31 seconds left in the game and they scored, squaring the game again at 9-9. St. Clare with 19 seconds on the clock had another opportunity to score from a foul. No luck. Overtime 2: (1 minute) With 32 seconds left in overtime, St. Clare scored two points at their basket. St. Pius could not convert on their foul throws following and had two opportunities to score with steals under their own basket. A great game by both teams! St. Clare: Sara, Sophia, Molly, Hadley, Sloan, Emery, Maeve, Addison. Coaches: Derek Costarella, Jonathan Eames. 2017 CYO Third Grade Basketball Champions! St. PIus X: Grace, Alexis, Annelies, Riley, Anna, Ashley, Emme, Reese, Lauren, Claire, Emma, Maeve. Coaches: Marc McCullagh & Molly Reding. St. Clare Coaches: Theresa Dreves, Tammy Ollivier. Players: Keara, Shannon, Charlotte, Sydney, Kate, Adeline, Francesca, Sofia, Mia, Anna, Rami, Gabriella. If you have ever watched much developmental volleyball, you will know the games at the lower grades are pretty much dictated by the ability to serve. This match was no different, however, the girls kept the games exciting for spectators. St. Clare took the first game 25 – 23 in a very close contest. The second game was also exciting with a lot of back and forth bumping, But St. Clare came out to an early lead and kept it going until they were ahead 20 – 10. 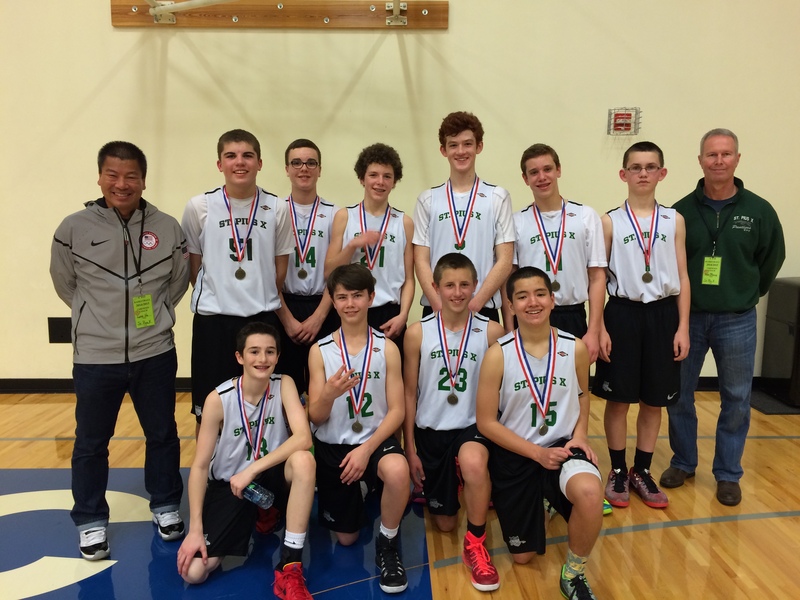 Holy Trinity rallied to 13-20 then 15 – 22. Holy Trinity kept coming back. Both teams were a little tense at the end of the second game which also became a factor. St. Clare took it in the end 25 – 21 in a great fourth grade match. Both teams will be fun to watch in the coming years. One of the most exciting games of the day, a very close game from beginning to the end where with 1 minute left it was till anyone’s game. With an 8 point lead, late in the fourth quarter St. Clare held on to win by 4 with a score of 35 – 31. 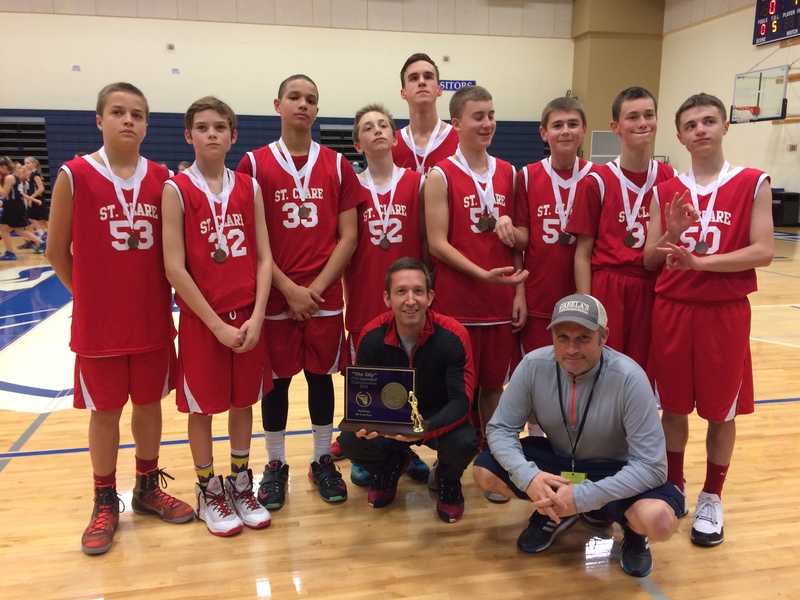 St. PIus X takes third place in the 2015 CYO City Basketball Tournament.